MD Helicopters owner Lynn Tilton has named industry veteran Charles Vehlow to be president of the Mesa, Ariz. manufacturer. Tilton directly ran MD for most of 2006 after having replaced the previous top management team of Robert Rene and Randy Kesterson. "I have been working quite closely with Chuck and the high-quality MD executive team over the last year as we have battled together to bring the MD Helicopter name back to prominence and its rightful place in the helicopter world," said Tilton, who heads the New York investment firm Patriarch Partners that bought control of MD in mid-2005. "The wisdom, experience and leadership that Chuck has demonstrated made him the natural choice for this job, which will include much of the day-to-day leadership." Vehlow will continue to hold the position of CEO of the Patriarch Aerospace Platform. Vehlow formerly served as a VP and GM for the Boeing Helicopter Division and VP of the Apache Program. A year ago, he was named director of operations for Patriarch Partners Management Group. He has more than 35 years of corporate, defense and management experience. "I welcome this opportunity to lead MD Helicopters," Vehlow said. "MD is focused on delivering a quality product to our customers, and continuing to support those customers who have stayed with MD. Ms Tilton and the Patriarch platform also offer many great opportunities for MD’s expansion in both products and services." The losers weren’t the only ones taken aback when the U.S. Air Force chose a variant of Boeing’s CH-47 Chinook for its next-generation combat search-and-rescue helicopter instead of newer, lighter rotorcraft. So was the Air Force’s top officer. "I was surprised because the system took us to a big airplane, the big, heavy airplane," Gen. T. Michael "Buzz" Moseley, Air Force chief of staff (right), told Rotor & Wing. Moseley added he wasn’t unhappy with the November 9, 2006 decision, which was formally protested by the other two competitors, for the $10-billion-plus Combat-Search-and-Rescue-X (CSAR-X). 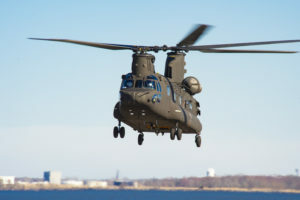 Unless the award is overturned, Boeing is to supply 141 new-build HH-47 Chinook variants from 2012 to 2019 to replace about 100 HH-60G Pave Hawks in the Air Force’s search-and-rescue fleet. "Am I disappointed in the Chinook? No," Moseley said. "Look at all the people that fly it. Look at the special-ops guys that are operating it in some pretty tight places. Look at the performance on the airplane. Look at what it’s been doing." Sikorsky Aircraft offered a military version of its S-92, the HH-92. Team US101 — Lockheed Martin Corp., AgustaWestland and Bell Helicopter — offered a variant of the European-designed EH101 designated US101. Sikorsky, followed by Lockheed, filed protests of the CSAR-X award in November with the Government Accountability Office (GAO), the auditing arm of Congress, which adjudicates federal contract disputes. Michael Golden, managing associate general counsel in the agency’s procurement division, said the Air Force would have 30 days to respond to the protest. The GAO by law must rule within 100 days of a protest — February 26 for Sikorsky’s and February 28 for Lockheed’s. The agency has yet to decide whether it will combine the protests, as it did in the case of challenges to the U.S. Army’s Light Utility Helicopter award last year. Lockheed argues "criteria used to evaluate competing proposals were not applied uniformly" and the "competitors received different instructions during the competition." Sikorsky says it "seeks to ensure the selection process accurately evaluated the characteristics and performance of" its HH-92." Boeing’s Chinook was new technology in the 1960s — two decades before the machines it would replace were fielded. And the HH-47’s maximum takeoff weight is 54,000 lb., more than twice the HH-60G’s 22,000. 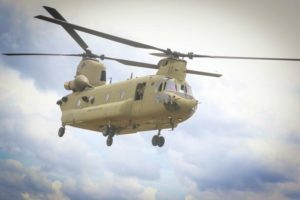 The Air Force described the Chinook as "medium-lift" in announcing the contract award, but the aircraft is generally regarded as a heavy-lift helicopter. "We’ll all be quiet and we’ll all let the system work through these protests, because I’m convinced that the source selection authority and our people at Wright-Pat did it right," Moseley said, referring to Wright Patterson AFB, Ohio. The Air Force Aeronautical Systems Center there handled the competition. "We’re getting a better airplane than the HH-60." Acquiring a new CSAR helicopter has been one of Moseley’s priorities ever since he became vice chief of staff in 2003, he added. He became chief of staff in 2005. "I pushed and pushed and pushed to accelerate the program...to get an airplane out there that’s more capable than the HH-60, because this is a core competency for us and a critical mission for us," Moseley said. "At the end of the day, whether it’s the Chinook or there’s an issue there and one of the other airplanes gets it, it’s going to be better than the HH-60. It’ll be more capable, more survivable." The initial award to Boeing’s helicopter division in Ridley Park, Pa., was a $712-million system development and demonstration contract. Under federal law, all work must be halted until GAO issues a ruling. The FAA is warning helicopter operators to verify their operational checklists are complete and pilots to ensure they stick to pre-takeoff checklists to verify key controls are free and functioning properly. In a Nov. 20, 2006 Safety Alert for Operators, the agency encouraged operators to review training programs and operational procedures, including checklists, "to ensure that pilots have the knowledge and effective operational procedures to avoid performing a takeoff in a helicopter without performing the required pre-takeoff checks." The alert was prompted by the investigation of a recent incident involving a Eurocopter EC135 operated by a Part 135 air carrier. The probe revealed the pilot had attempted a takeoff with the cyclic-stick control lock engaged. The pilot lifted off, and subsequently attempted to land at the helipad, according to the agency, and the resulting hard landing damaged the aft landing crossover tube and the aft underside of the fuselage. The FAA-approved EC135 flight manual requires the cyclic-stick control lock to be unlocked after starting the first engine, but the operator’s checklist did not contain a reference to that control lock. The incident was one of several, the FAA said, involving pilots taking off without accomplishing the required pre-takeoff checks, or taking off in helicopters that were not in a condition or configuration appropriate for the takeoff maneuver. These other accidents and incidents have been related to pilots failing to properly prepare the aircraft for takeoff. Examples include pilots not ensuring all engine control levers are in the "fly" position and not accomplishing a required hydraulic or auto-flight pre-takeoff check. The FAA requires Part 135 operators to provide crewmembers with appropriate checklists. These checklists are often truncated versions of checklists contained in FAA approved flight manuals. Operators are responsible for ensuring that flight-critical items, including aircraft tie-downs, control locks, required pre-takeoff checks, and system and power control configurations are included in their checklists. Estonia’s Environmental Inspectorate has taken delivery of an Enstrom 480B. The helicopter will be based in Tallinn and operated throughout the Baltic Sea nation. The inspectorate is planning to fly the aircraft 250-300 hr this year, according to Enstrom, and anticipates its usage will increase in subsequent years. The Enstrom 480B will also be used jointly by other organizations of Estonia’s ministry of the environment, such as its Nature Protection Center, Land Board, State Forest Management Center and local branches of the ministry. The Nature Protection Center has already booked flight time for the March-June period for a survey of nesting birds. "This helicopter will broaden our effectiveness and specifically improve our abilities to cover areas and fields that are very difficult to supervise and control from land," said Tarvo Roose, deputy director general to the Environmental Inspectorate. The inspectorate is responsible for environmental supervision and law enforcement in all areas of environmental protection in Estonia, including forestry, fisheries, hunting, beach and coast protection, nature protection, waste treatment, and waterways supervision. Aerospace Filtration Systems has received a supplemental type certificate (STC) from the FAA for an inlet barrier filter system for the AgustaWestland A119 Koala. The approval clears the way for Koala operators to gain a way to improve engine protection and reap performance and maintenance benefits. The Koala inlet barrier filter system has three flat filters incorporated into a compact structural housing assembly that is designed to slip in and replace the current foreign-object damage (FOD) screen assembly. The upper filter functions as the bypass door and allows internal inspection when required. An integral filter maintenance aid allows on-condition inspections between cleaning intervals of 300 hr, eliminating unnecessary service. A U.S. federal judge has agreed to supervise mediation between PHI and the union representing pilots seeking to return to work at the offshore and EMS operator after an unsuccessful, 51-day strike, according to the union. The mediation between the company and the Office and Professional Employees International Union was to begin Dec. 14, 2006, in the federal courthouse in Lafayette, La., under the supervision of U.S. Magistrate Judge C. Michael Hill. The mediation is the result of a Dec. 4 conference with U.S. District Judge Rebecca Doherty. The agreement for mediation puts on hold proceedings on the union’s request for a preliminary injunction against PHI. The union on Nov. 27 filed a complaint in federal court in Lafayette charging PHI with violating the U.S. Railway Labor Act by refusing to reinstate its striking members, who ended their strike Nov. 10 with an unconditional offer to return to work. The union had been asking the court to require PHI to "immediately reinstate with full back pay and benefits" the PHI union pilots "who engaged in a protected work stoppage and made an unconditional offer to return to work at the conclusion of the work stoppage." The complaint, which gives a detailed history of the 30-month-long contract dispute with PHI, alleges that "in violation of the [Railway Labor Act]" the company has "ignored the unconditional return to work offer and/or placed illegal conditions on the offer." The British defense technology firm QinetiQ has completed the first test flight of advanced, composite main-rotor blades on its Sea King helicopter. Carson Helicopters of the United States produced the blades, which are based on ones it developed for use on its Sikorsky S-61 firefighting aircraft. They use advanced airfoil sections, increased twist and a swept tip designed to produce significant performance gains. Boeing Co. and Bell Helicopter have delivered the first CV-22 to the U.S. Air Force Special Operations Command at Hurlburt Field, Fla. The head of the command, Lt. Gen. Michael W. Wooley (right), marked the occasion Nov. 16 by piloting the Osprey tilt-rotor to Hurlburt. The command is scheduled to receive 50 CV-22s through Fiscal 2017, replacing MH-53J Pave Lows. The Ospreys are to be assigned to the 8th Special Operations Sqdn. at Hurlburt and the 71st Special Operations Sqdn. at Kirtland AFB, N.M. Initial operating capability is slated for 2009. The Osprey’s delivery coincided with redesignation of the wing at Hurlburt as the 1st Special Operations Wing. The unit traces its lineage to the 1st Air Commando Group of World War II’s Burmese theater. It had been known as the 16th Special Operations Wing since Oct. 1, 1993, when a change in Air Force policy prohibited multiple units from sharing the same numerical designation. At the time, the service also had the 1st Fighter Wing at Langley AFB, Va. and 1st Space Wing (since deactivated) at Peterson AFB, Colo. The fighter wing kept its designation. The 16th Special Operations Wing will be assigned to a new special operations unit at Cannon AFB, N.M. slated to stand up in October. Russia’s efforts to market military equipment to Latin America are bearing fruit, according to a new survey of the region’s defense market. The survey by the research firm Forecast International finds that, while initial Russian penetration of the market came through helicopter orders from Mexico, Venezuela is now chalking up the biggest purchases. A series of orders for helicopters and assault rifles, among other items, was capped by the July 2006 sale of 24 Sukhoi Su-30 fighters, Forecast International said, bringing to $3 billion the value of Russian deals signed with Venezuela in less than two years. The Venezuelans are expected to place orders for additional helicopters, according to the firm, as well as tactical transport aircraft, submarines, and air defense systems. High oil prices are funding these procurements, but the recent softening of these prices could force Venezuela to reduce the scope of purchases. The Russians have made inroads in other countries as well, including Colombia and Uruguay, with Brazil, Chile, and Ecuador potential customers, the firm said. Argentina may prove a major sales opportunity, now that its legislature has approved a military accord with Russia. The Russians are offering an array of products, but the Argentines are primarily interested in helicopters, transport aircraft, and air defense systems. Its interest is directly tied to a revitalization of the military’s force structure, which follows years of tight funding. The Argentine military has considerable pent-up re-equipment needs. 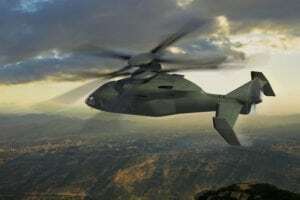 The U.S. Marine Corps is using its CH-53Es so much that operating costs and maintenance man-hours are soaring, making it urgent that the service get the new CH-53K on time, the service’s deputy commandant for aviation told Rotor & Wing at a Dec. 7 briefing. "We’ve got to replace the Echo because we use it for so many things," said Lt. Gen. John Castellaw. The three-engine CH-53E leads the Marine rotorcraft fleet as far as operational costs go. For every hour the Corps flies a -53E, it spends 44 maintenance hours fixing it. Every hour a Super Stallion flies it costs about $20,000. Pentagon auditors have told Sikorsky Aircraft that "quality is deteriorating, schedule is not getting better in the short term, and the seriousness of the errors... [is] becoming untenable," according to a Dec. 8 report in Rotor & Wing’s sister publication, Defense Daily. Citing a Nov. 22 letter from the commander of the Defense Contract Management Agency unit at Sikorsky, the report said the agency wanted a plan from Sikorsky by the end of 2006 on how it will specifically address issues with the company’s UH-60L and HH-60L Black Hawk production line. The problems apparently are not new, having been raised by the DCMA official, U.S. Navy Capt. Dorothy Freer, in June 2006. "Regrettably, we find ourselves nearly five months older and no better off," she said in the latest letter to Sikorsky President Jeff Pino. 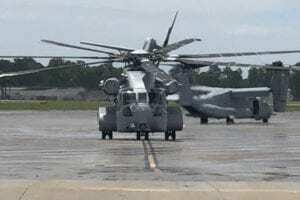 The root cause of the quality problems is the rapidity of Sikorsky’s transformation "and its poor execution, along with the culture at Sikorsky," Freer told Pino. The letter put Sikorsky on notice that the defense agency had issued a Level 3 Corrective Action Request to the company over issues with the UH-/HH-60L production line. A Level 3 request is issued to call attention to serious contractual non-compliance and follows prior requests for corrective action that have been ineffective. It is said to be one step below the possible suspension of the contract. In a statement in response to reports of the letter, Sikorsky said "safety is our top priority... Safety and quality go hand in hand." The 4th Battalion, 101st Aviation Regiment returned to Fort Campbell, Ky. Nov. 17 from a year-long deployment to Iraq. Thirty-one UH-60 Black Hawks of the battalion’s 159th Combat Aviation Brigade in separate formations conducted a flyover of Sabre Army Heliport at Fort Campbell. The aircraft arrived after flying all day from Jacksonville, Fla., where they had been unloaded off ships and individually pieced back to flying condition. Vanderbilt University’s School of Engineering is leading a new FAA program to apply and expand aging-aircraft reliability techniques to helicopters. The five-year, $1.5-million project was kicked off in a project team meeting at the end of November 2006 at the agency’s Technical Center in Pomona, N.J. Helicopter safety has become an increasing concern because the number of EMS helicopter accidents in the U.S. nearly doubled from the mid-1990s to 2004. Although most of these accidents were caused by weather, difficult terrain conditions and pilot error, program officials said they want to ensure that the equipment gives pilots every advantage. "The margin for error in flying a helicopter, especially in rescue missions, is very slim," says project principal investigator Sankaran Mahadevan. "We want to make sure that helicopter pilots don’t have to deal with equipment failure, such as metal fatigue, on top of the challenges of shifting winds, unseen obstacles like power lines, birds flying into the blades, and space limitations of maneuvering in tight spots." EADS North America publicly delivered the U.S. Army’s first UH-72A Dec. 11, 2006 at the Columbus, Miss. facilities of American Eurocopter. The ceremony at the plant gave officials of the company that led last year’s winning bid in the Light Utility Helicopter competition the opportunity to claim their delivery was three months ahead of schedule. In fact, EADS officially delivered the first aircraft — designated the Lakota in keeping with the Army tradition of naming helicopters after Native American peoples — Nov. 29, which was "on time." Despite an unsuccessful protest of the June 30, 2006 contract award by MD Helicopters and AgustaWestland that halted work for 100 days, EADS and the Army held to the original program schedule. That called for delivery of one UH-72A by Nov. 30 and a second by New Year’s Eve. The aircraft "delivered" Dec. 11 had, in fact, been flown back to Columbus from Fort Rucker, Ala., where the Army had put more than 20 hr on it. The Army was slated to take delivery of the second Lakota before Christmas. Its plans call for acquisition of 322 Lakotas, though it may buy more for other U.S. agencies. The French defense procurement agency DGA is tapping Sagem Defense Securite to conduct a study to identify the joint needs of France’s army and navy for a vertical takeoff/landing unmanned air vehicle. French officials said the study could form the foundation of that nation’s future UAV programs. A key challenge of the study, according to Sagem, will be identifying a UAV that can carry out a wide range of missions in a variety of operational theaters and conditions, ranging from takeoff at high altitudes under hot conditions to landing on a frigate in extremely rough seas and foul weather. Sagem is considering a solution based on Bell Helicopter’s Eagle Eye tilt-rotor UAV. This follows a teaming agreement signed in June 2004 between the companies to offer European armed forces a new generation of VTOL UAVs. Bell is developing the Eagle Eye for the U.S. Coast Guard’s Deepwater fleet modernization program, for other agencies, and for commercial customers. The Eagle Eye’s development was delayed when its TR-918 prototype crashed Apr. 5, 2006 at Bell’s test facility in Graford, Texas. Sabreliner Corp. has been awarded a contract to upgrade navigation systems and install upgraded interiors in four U.S. Army VH-60s (above) used to transport VIP passengers in the metropolitan Washington area. The work is being performed at Sabreliner’s Perryville, Mo. operation under a subcontract from ARINC Engineering Services. Under the terms of the contract, Sabreliner already has installed a state-of-the-art flight management system (FMS) in the four helicopters and an additional UH-60. The FMS supplies pilots with more easily interpreted color displays, the company said, providing them enhanced situational awareness and more efficient data-entry methods to reduce head-down time. Boeing’s A160 Hummingbird unmanned rotorcraft returned to flight test in November 2006 after a 15-month hiatus. The aircraft conducted a flight test Nov. 8 near Victorville, Calif., according to the company, performing hover and forward flight maneuvers. The flight was the first of an A160 since its prototype crashed in August 2005. Boeing is developing the aircraft with U.S. Defense Advanced Research Project Agency (DARPA) funding. "The success of this latest flight is a tribute to the hard work of the Boeing and DARPA A160 team," Boeing A160 Program Manager Jim Martin said. "This innovative unmanned aerial system continues to prove its versatility through a rigorous flight test program." Engineers are evaluating results of the Nov. 8 flight to determine the next flight-test objectives. The A160 is powered by a six-cylinder Subaru gasoline engine, but Boeing is assessing other powerplant options, including a lightweight diesel engine and a turbine engine. Boeing said it anticipates first flight of a turbine A160 by mid-year. The Libyan Red Crescent has purchased five A119 Koalas for emergency medical service missions. The Red Crescent’s main activity is providing medical services through its network of health centers and clinics. It also participates in disaster relief and health education activities in Libya. "This choice strengthens AgustaWestland’s position in the growing Libyan market and follows the recent sale of 10 A109 Powers" for Libyan border patrols, said Renzo Lunardi, AgustaWestland’s marketing and sales director. A year ago, AgustaWestland and its parent, Finmeccanica, set up a joint venture with a Libyan company to develop the capacity to modernize and maintain Libya’s existing fleet of fixed- and rotary-wing aircraft, including establishing a flight and maintenance training center in Tripoli. Dart Helicopter Services has acquired Geneva Aviation in a stock transaction. Formerly a unit of The Helinet Group, Geneva is a systems integrator and manufacturer of specialized equipment for the law enforcement, broadcast and private helicopter markets. It is a leader in high-definition ENG integrations and holds more than 25 supplemental type certificates for AS350, 407 and 206 aircraft. Geneva will continue to operate from its facility in Kent, Wash. Dart President and CEO Jeff Shapiro will act as its president and CEO. "We are extremely happy to bring Geneva Aviation" into the Dart family, Shapiro said. "The Geneva line of AS350 products is a perfect fit for our well-diversified product lines." He said Dart will "continue to use the expertise of the Geneva engineering group to develop state-of-the-art STC’d products for the AS350 and other products." Piney Flats, Tenn.-based Dart also said its affiliated partner, Dart Aerospace, after completing the final tests of their Agusta A119 Heli-Utility-Basket, has now received the Transport Canada STC certifying the latest re-design of it for installation on that aircraft. CHC Helicopter Corp. has purchased Heli-Dyne Systems from FSS Air Holdings. Heli-Dyne became part of CHC’s Heli-One group effective Nov. 30. Heli-Dyne operates a 30,000-sq-ft helicopter completion and maintenance center in Hurst, Texas. 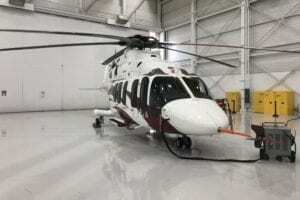 It specializes in helicopter interior completions, including emergency medical service configurations, and maintenance of airframes, engines and avionics. Heli-Dyne employs about 75 full-time workers, and is an authorized service center for AgustaWestland, Bell Helicopter, Eurocopter and MD Helicopters. The acquisition comes as CHC is pursuing more opportunities in the air medical sector. The company in December won a seven-year EMS contract to provide five aircraft in the Sydney, Australia area for the Ambulance Service of New South Wales. EMS "is a growing area that is going to take a lot of capacity," said CHC CEO Sylvain Allard. Pratt & Whitney Canada has opened a new parts distribution center in Amsterdam with the goal of providing rapid parts deliveries for its engine customers in Europe, the Middle East and Africa. "This is the first of several steps we are taking to strengthen our focus on delivering additional value to our customers in the European, Middle East and African markets," said Maria Della Posta, Pratt & Whitney Canada’s vice president for customer support. P&WC is counting on the new center’s location within the European Union and proximity to Schiphol International Airport to significantly increase the availability of parts "and ensure that our customers receive what they need when they need it," Della Posta said. The center carries a large inventory of new parts, accessories and line-replaceable units for all P&WC engine models. It will serve customers who formerly called on the manufacturer in Canada for parts. Its goal is to deliver parts in 24 hr or less. The FAA is proposing to amend regulations for repair stations by revising the system of ratings and requiring stations to develop a quality assurance program. The recently issued notice of proposed rulemaking (NPRM), in the docket FAA-2006-26408, proposes significant changes including requirements for repair stations to establish and maintain a capability list, designate a chief inspector and establish permanent housing for facilities, equipment, materials, and personnel. Comments are due March 1. The NPRM comes at a time when the FAA is facing increasing criticism by both the U.S. Transportation Dept. inspector general and Congress’ General Accountability Office regarding its inspection and aircraft maintenance oversight. The Aircraft Electronics Assn. criticized the NPRM, saying it was concerned that the FAA has taken great latitude from the original repair station NPRM and the work of the Aviation Rulemaking Advisory Committee and proposed to reverse many of the hard-fought provisions of Part 145.